What a difference a week can make. On 5 Jan, I had a truly awesome run – great company and faster than I expected, I was middle of the pack not bringing up the rear. Oh yeah! I felt amazing! Then ensued a stressful and sleep deprived week. I didn’t manage any mid week runs and then had to miss the social run I was really looking forward to on the Saturday. I did get out on Sunday though and it was like my legs decided not to accompany me, I was back to being the chubby lagging behind, even though the previous week I’d been feeling strong. To be fair the run was 4.5 miles longer with an extra 200m of climbing, so it wasn’t easy by any stretch of the imagination but I still wasn’t as STRONG! Maybe it was the sleepless nights or the stress but something was different. Guess what was still the same though? the runner’s high – isn’t that what we all crave? I hope I have more oomph next weekend when my run will be a 40km for 40 birthday extravaganza for two of my lovely running friends but even if my little legs aren’t on board I know I’ll still have a great time. Well, 2013 has been an exceptional year for me and I have really enjoyed it. It’s safe to say I’ve been properly bitten by the running bug and more accurately the ultra running bug. I’ll soon be 37, short and stocky, so endurance is probably the best prospect for me – good thing I like it and am darn stubborn too. I owe a debt of gratitude to many people that have trained with me, encouraged and supported me and I hope I’ve done a decent job of thanking them. There’s also the folk that ‘put up with me’ – my long suffering boyfriend who puts up with me spending hours out of contact on the trails with my running buddies and the really important part for me is that he believes in me and never doubts that I will do what I set out to do, and that’s incredibly empowering for someone that in her younger years had relationships that had entirely the opposite effect on her confidence. Marcothon – run every day in December, completed. As well as running I also went snowboarding at Glenshee, hovercrafting in Dunfermline, riverbugging near Pitlochry and wakeboarding near Dunbar. I went to a few gigs, most notably I saw Frightened Rabbit twice and they were excellent. I’ve been to three lovely weddings and some good friends have welcomed little ones this year. 2013 has been good to me, I feel like I squeezed the pips right out of it! I’ve signed up for a few events and hope to make some changes to restore my work/life balance. I also plan to cycle for cross training and to spend some time with Tom and exercise the dog at a pace she considers a bit more respectable. 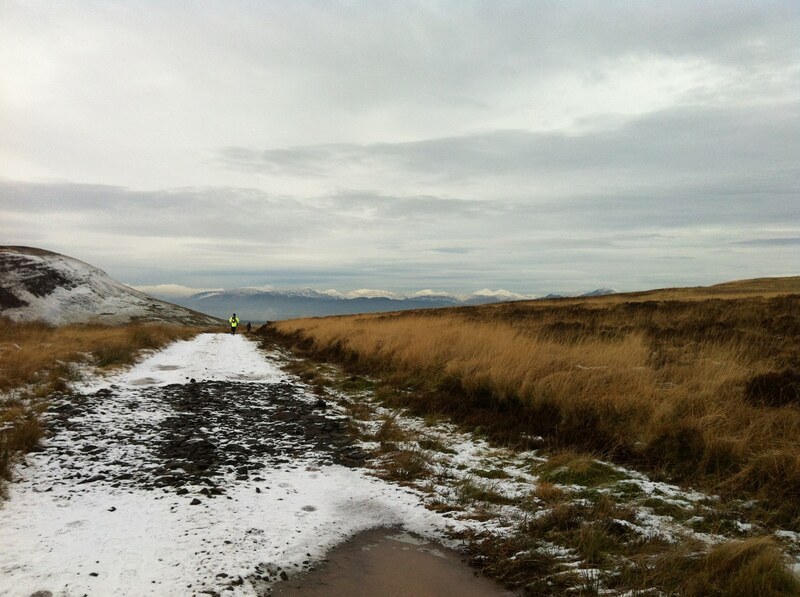 D33 on 15 March – 33 miles on the Deeside Way, yummy! Highland Fling Relay in April – I will do approx half marathon distance over one of the relay sections then dance the night away at the after ceilidh before overnighting in a yurt. Yes, my life really is that cool! Kintyre Way Half Ultra (c. 36 miles rather than 67 miles) on 10 May – my ‘A race’ I reckon as this is really tough with hills and technical trail including the possibility of wading through the sea. I’m very glad that two of my good friends and running buddies are coming too. G12 on 6 September – that’s 12 hours of running a 4 mile loop that comes through a base camp with a party atmosphere. To say I’m excited would be an understatment.